Assembled from NOS industrial pushbuttons. Limited availability. Comes as shown, with permanent, engraved white lettering. Authentic, brand new, hard to find pieces. Limited availability. Rocker switch is SPDT : ON - OFF - ON. Each rocker switch includes a new lamp bulb suitable for 12V application. Lamp terminals are separate from the switch and can be operated independently. Lamp is replaceable, rated life of 2,000 hours. Switch contacts rated 3A at 30 V DC. Exactly as seen in the lower console of the season 1 and season 2 car. Authentic, brand new GM restoration parts. With the correct UP and DN lettering. 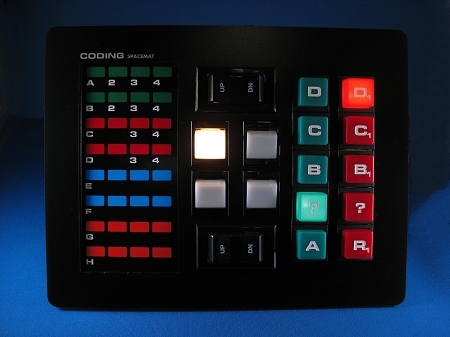 Dummy CODING keypad reproduction for your KITT or KARR replica. Non functional. Perfect for building your own KITT on a budget. Gives a clean, updated look to the lower console. 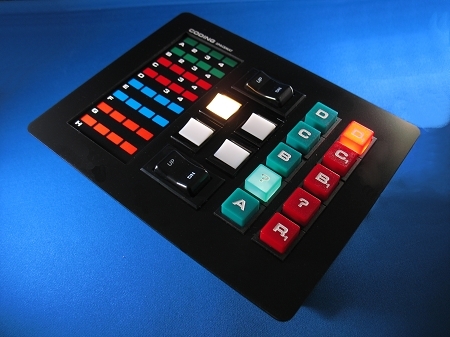 Includes a mounting panel, reinforced with an engineering polymer backing plate. Panel is machine cut to exactly 200 x 155 mm (7-7/8 x 6-1/8 inch). Please check your lower console dimensions to make sure this is the correct size. If not please contact me for custom sizes.